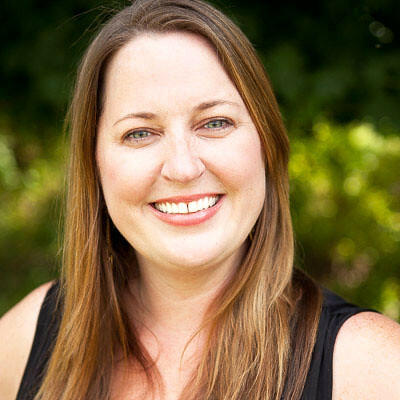 Our next Special Guest Star is new to the w&w blog, but such a lovely and gifted designer. I had the pleasure of meeting Cheiron in person and she really is a delight! I am so happy to have her make her stunning debut today. Please give her a very warm w&w welcome. Hi there! My name is Cheiron Brandon and I am delighted to be a guest star at Winnie & Walter this month to help them celebrate their big Birthday Bash. Thanks so much for having me. I have been card making and stamping for a little over 10 years now. I live in New Jersey (right outside of NYC) with my husband and our two adorable rescue pups Big Boy and Oreo. During the day, I work in the financial district and at night, I love to come home and create in my studio. I share my love of creating by teaching monthly card making classes at The Ink Pad in New York City. I decided to celebrate by playing along with two of the super fun challenges going on this month, the first being Kelly’s Stencil Challenge. I love the idea of using stencils as a background and created a card using the Scenery: Pattern of the Rings Creative Screening Stencil. This card uses a monoprint technique on the stencil to create the background. Simply apply Distress ink to your stencil, mist it with water and press it onto watercolor cardstock to create a monoprint, then lift it off . Since the background is so fun and colorful, I added just a big bold In a Word: Congrats Cutaway to finish it up and a bit of contrasting trim using the Lulu Fringe Cutaway. 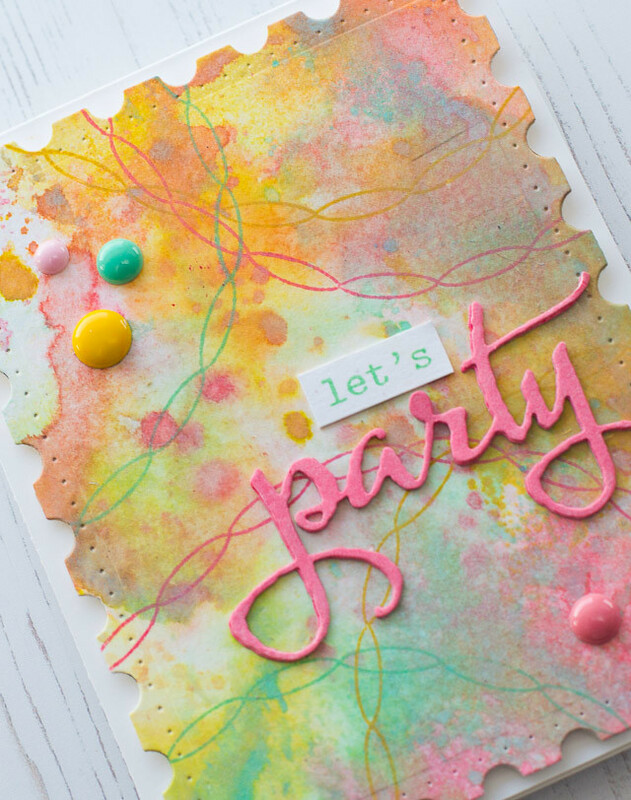 This is a great way to play with new supplies and color combos. 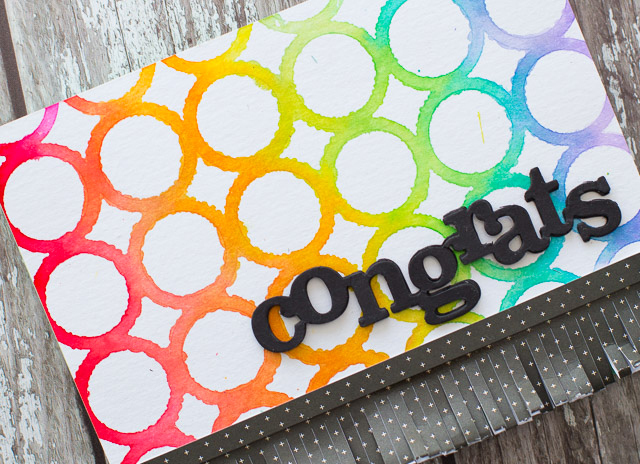 Simply create a bunch of backgrounds and keep them to turn into cards later with a simple, bold greeting. For my second card, I played along with Mayuri’s Pattern Making Challenge. I love creating my own patterns with stamps and thought the streamers from the Scenery: The Party Hangover set would make a fun, subtle pattern over my Distress Oxide inked background. I just love the festive touch they add over these soft colors. I added the phrase party using stamps and dies from The Big, TheBold and Party Cutaways. 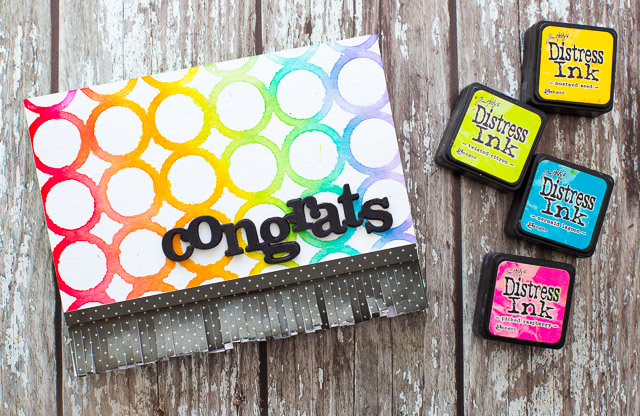 I created a coordinating color die cut by applying the same inks direct to paper then cutting out my word. Thank you again for having me today. Wishing you the very best of birthdays and so glad I could come along to the party! Love these colorful and pretty cards. The backgrounds look awesome :) thanks for the ideas. Hello Cheiron, beautiful cards! I loooove the way the distress came out, amazing! I haven't played with my big and bold and party hangover in a while, but I will this week. Thanks for sharing and inspiring. wow! !both the cards are so beautiful and colorful..love them. 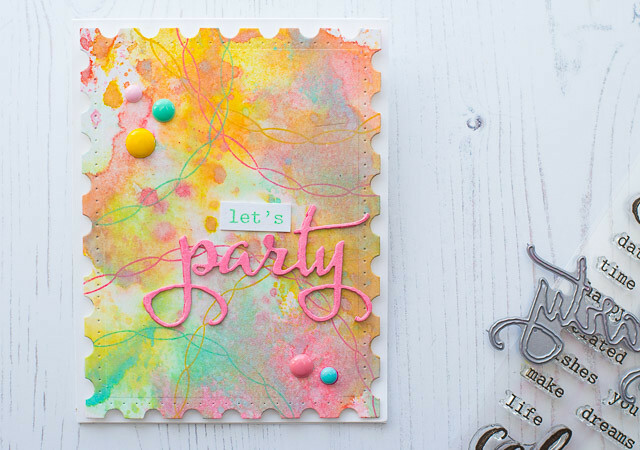 You have taken a real big party approach to your cards using these W&W supplies, Cheiron! LOve the ruffles!!! Both are great cards Cheiron and either design would work for most any occasion. Good job! sigh, no one rocks color like Cheiron! These are BEAUTIFUL. Great cards! I like the simplicity of your first card. You always inspire me, Cheiron--could spend all day staring at these cards!